Digital Transformation has been a rallying cry of CXOs over the past few years, and global disruption, due to digitization, has yielded many examples of industry powerhouses becoming a footnote in history. It should come as no surprise then, that a major trend emerged in the most recent Vanson Bourne Global Data Protection Index commissioned by Dell EMC – data is almost unanimously understood to have value and 75 percent of respondents are either already monetizing it or are investing in tools that will help them monetize it in the future. As data becomes more valuable to an organization, there is a corresponding move to collect more of it and keep it for longer. The concept of Data Capital has become ingrained in every industry, as organizations find that using data to power applications and gain new insights from analytics, sets them apart from the competition. This results in a point of friction, as the creation, acquisition and protection of data are somewhat at odds. Data protection challenges range from financial (affordability of backing it up) to logistical (delivering performance and coverage). These played a significant role in the limited improvement of data protection maturity in companies we surveyed. 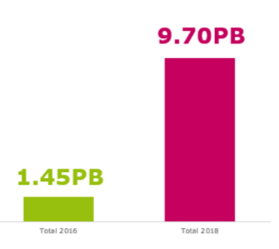 Simply put, what worked to protect 1.5PB of data a few short years ago, won’t work for the almost 10PB of data respondents averaged in the latest study. Not surprisingly, such growth has also created a myriad of challenges for organizations with availability and data retention. More than three-quarters (76 percent) of respondents have experienced disruption of some kind in the last 12 months. To make matters worse, these service level events are coming about through all manner of sources, making it nearly impossible to eliminate risk entirely. From infrastructure failures and ransomware attacks to data corruption and user error, or even cloud provider issue, it’s time to realize we cannot eliminate the cause of a service level event. We can, however, mitigate the damage it causes by having an effective data protection strategy and solutions in place. When looking at events that resulted in a disruption, we separated these events into two categories — downtime and data loss. Across these two areas, respondents noted substantial impacts from events. One of the most surprising results revealed that those who scored higher in the data protection index were more vulnerable to substantial losses in the event of an outage or data loss. This magnified impact was likely due to the increased importance data plays in their business but shows just how essential it is to get data protection right. Read more about disruption and creating a strategy to protect essential data. Subscribe value to data and protect it accordingly – Globally, 81 percent of survey respondents say they treat data differently based on its value. As data continues to grow exponentially, it is essential to leverage a variety of data protection strategies across continuous availability, replication, backup, archives, etc. creating an effective data protection solution that can scale. Consolidate vendors to lower risk – Across the board, respondents who used multiple vendors increased the likelihood of something going wrong. Organizations with only a single data protection vendor were twice as likely to indicate they had not experienced a disruption in the last 12 months, with 40 percent reporting they had no adverse issues. Protect more in the cloud – Automatic backup to the cloud was the most frequently included technology as part of a comprehensive data protection strategy with 43 percent of respondents indicating they were using it. This is critical to leverage moving forward, both to defer costs of traditional data protection, as well as to provide coverage within cloud environments themselves. Ultimately, the report paints a picture of organizations trying to keep up with the data deluge, it’s increased value to the organization, and new advanced workloads that strain existing data protection solutions. We’ve entered a new age where protecting data has morphed into the need to apply advanced data management strategies to keep it both safe and available at all times. Data Protection can no longer be bolted on as a simple insurance policy, but should be a primary design consideration for any workload that the organization is prioritizing. Over the coming months, we will continue to highlight new technologies and strategies to use in meeting the ever-increasing needs in this space. For now though, please find your complimentary GDPI report here.